It has been (only) over one month since SimiCart version 3.0 was released lately with brand new looks and upgraded features. SimiCart team, however, did not sleep on it. We still keep working hard to improve and today, SimiCart version 3.1 comes out happily with several new updates in layout and UX. Let’s take a short tour through its change now! 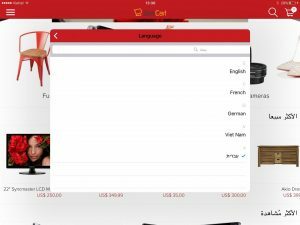 Build mobile shopping apps without having a website ! Your customers will love this update. Instead of having to click on each tab manually to open and select the options, now when they come to product options page or order review page, the first tab will be automatically opened. When your customers have done making a choice, automatically that tab will be closed and the next tab will be opened for their next options. It is much more convenient and time-saving to go through all options for the product your customers want to buy. Similarly, when customers place an order and be redirected to order review page, they also can quickly pick their choice for shipping or payment without having to tap on tabs themselves as before. Now in SimiCart version 3.1, shoppers can make products live search by category instead of making the search on all products. Simply check in the “Search on Shirts” option to select a product category they want to look for. 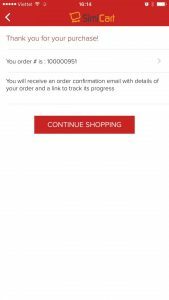 Thank you page is updated to have order tracking link directly on the screen. 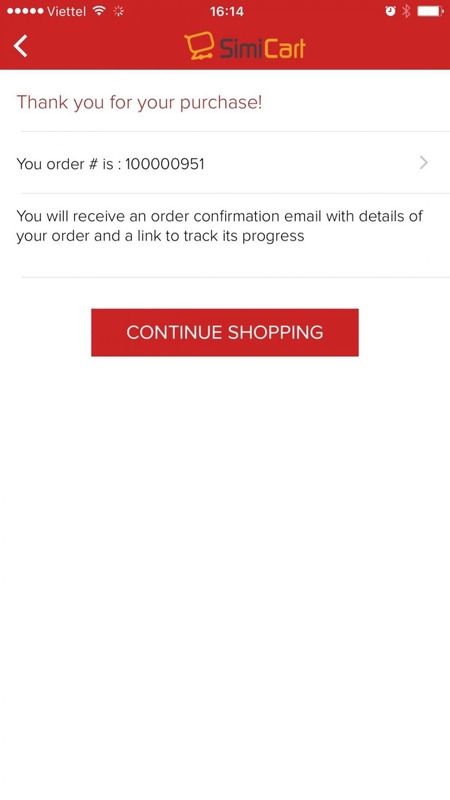 Users can check their order information by clicking the order link or continue shopping as normal via mobile. Sometimes your customers may miss your products just because they do not realize the product sliders that can be scrolled side to side to see the full list. That’s why we make up this feature called “Shaker”. Movement catches visitor’s eyes. When the customer land in the app, the product slider will “shake” lightly so that they will realize the product slider can be scrolled. You may already find RTL language support feature in our 3.0 version. In this update, we make RTL language support more fluidly for you to translate your site into your proper language. Material design is the popular trend for website and mobile interface introduced by Google. SimiCart is in, too. We have updated some elements and animation for Android mobile app that follows the material design concept. More updates following material design will be expectedly released in the next versions. You can experience yourself in our Demo now! CREATE A MOBILE APP, NOW !